This day came to be remembered as one of the nicest bits of this year’s walking holiday. There was no rain as we packed up the tent and set off, admiring the familiar view across Blue Anchor Bay as we went, and it was even a little bit sunny. 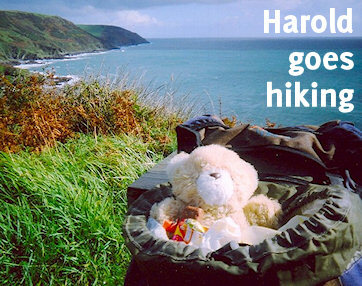 We were on the road again by 11am (um… well, we’re definitely night owls and not larks) and walked back along our detour to rejoin the coast path. While walking in the wet and fog the previous day we rejected the “challenging” and extremely steep alternative path that would have taken us down the Burgundy Chapel route we have always wanted to walk but have never yet succeeded in taking. But instead of following the familiar path over Selworthy Beacon we took the alternative route along the edge of the cliffs as recommended by the SWCPA. 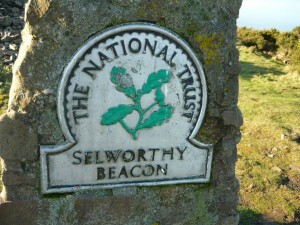 It was odd not to take the route across the beacon that we knew so well but definitely a good choice – once again we got to see some parts of Exmoor that we had never previously seen despite years of visits. 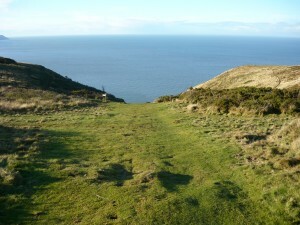 The terrain was grassy sheep-pasture with stone walls for field boundaries and it was especially nice to be able to see every bit of coast between Minehead and Porlock after so much time spent staring at it on a map. An important discovery of this week was the satisfaction you get from being able to relate landscape to map in this way. (Disappointingly, though, we were too high to see the submerged forest.) The sea was an incredible colour and an almost impossible distance away and occasionally it was possible to see narrow strips of beach and outcrops of shingle at the bottom of the cliffs in places where people never go because they simply cannot be reached. We spent half an hour perched on a grassy outcrop about eight feet from the cliff edge not saying much and staring at the sea. We also saw very few other walkers. Here there are some big detours around the heads of combes which can sometimes be demoralising. But this time they were not because we could see the land disappearing under our feet and could observe our slow but steady progress along the living map of the coast that we were traversing. Walking on Exmoor is always wonderful – as long as you can refrain from harping on about stepping in sheep turds and picking up ticks, which doesn’t always happen in our party. We rejoined the familiar path near the top of Bossington Hill, walked past the cairn and came to the top of Hurlstone Combe, arriving at around 5pm and watching the sun set. We had been walking for some time now and the distance was starting to take its toll. Walking down Hurlstone Combe is an effort at the best of times and we were extremely relieved, in fact, not to be going up it. The combe was as wonderful as ever with scree slopes, grass, rocks and lots and lots of wild flowers that appearlike a moonscape or utterly foreign landscape. Our legs were shaking with the effort by the time we reached the bottom so we sat on a bench and looked at the sea for a while – milky, calm and seemingly as warm as a bath under the misty sky. After Hurlstone – we were too weary for a detour to the Point – we walked along green lanes to a familiar car park in Bossington village. It was nearly 5.30pm and we were hungry and parched. We found a tea garden still open and settled down for a huge cream tea with sandwiches. We also met the resident dog, rather elderly, and thoroughly used to being spoiled so mere food titbits were nowhere close to enough to bribe him. 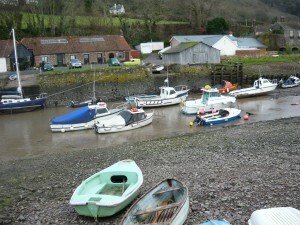 After tea we set out on the final leg from Bossington past West Porlock to Porlock Weir where we were due to stay at a B&B on the seafront. 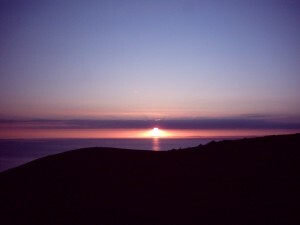 We had arranged to arrive after 7pm as the proprietor had a christening to attend and we turned up not very long after the appointed hour – the only point on the whole walk which was truly to schedule. But first we discovered the long sweep of shingle beach between Bossington and Porlock Weir is at least twice as long as it looks. There has been a problem recently with the shingle ridge as a bad storm in November 1996 penetrated the wall of stones and flooded a large area of cattle pasture behind it with salt water. This has provided a unique marine habitat for all sorts of interesting wildlife but not, unfortunately, walkers. The path was diverted inland via West Porlock for those who wanted to take it and on our walk there were plenty of signs warning against going along the coast at high tide. But it was not high tide and we had no intention of missing out on this bit. We were lucky as the situation got much worse in subsequent years and for a while the route was out of bounds altogether. The Porlock shingle ridge is an interesting place at any time and we saw it in the evening when it had a nice rosy glow from the setting sun. At the Bossington end it starts out with huge stones, grass behind it and the first of many wartime pillboxes and derelict stone structures which do so much to enhance the strange and alien quality of the landscape. Walking on the shingle is quite difficult and at the beginning you cannot see very much because the path goes along behind the ridge. 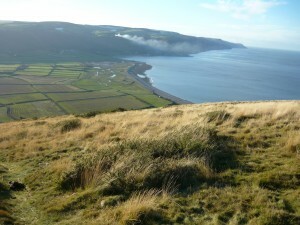 After a while though we were on top of the ridge and could see the sea again and Porlock Weir getting closer and closer. We chose a white house we could see in the village and decided that was the B&B – what an awfully long way away! Before long we got to the section where the ridge had been breached by the sea and things got awfully muddy. It was an interesting sight but not one I would want to see at high tide. There was mud everywhere, the thick, clingy kind you get on some muddy beaches like Blue Anchor just up the coast, and it had long channels in it from the water draining back at low tide. It looked more like an industrial area or a building site than something naturally made – especially as the sea had uncovered an old rubbish dump full of scrap. We had a couple of hairy moments before we were sure we had got past it. Then it was downhill all the way to our destination for the evening. 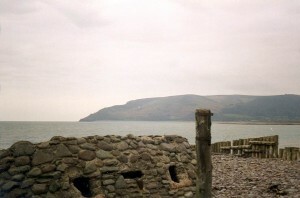 We really like to visit Porlock Weir because it has barely changed, in our eyes, since one of us visited it as a child, although our landlady pointed out that there have been plenty of changes for those on the spot to see them. As we walked into the village we peered at the cottages trying to find our destination and we came across it pretty soon opposite the seafront car park. The grand white building we were aiming for was at the other end of the village. The cottage was called Sea View and, unlike many establishments of that name, it certainly did have one. The B&B was so nice we wished we were staying longer. We had our dinner in a pub, had a single malt Scotch each, and finished a very pleasant evening with a stroll round the harbour.